The exhibition venue is a former 2,000 sqm industrial warehouse, where Promotedesign.it creates an experiential journey by carefully finding and selecting innovative brands, young labels and historic brands to show the best that the contemporary design scene has to offer. In previous editions, Din – Design In hosted over 800 realities from more than 80 different nations who showed their design ideas, describing the design process that led to the creation of the object and highlighted the distinctive features of each single country. The installation “Beyond the Wall” by the artist Erika Calesini will take place on the external wall of the venue. The work aims to convey a message with a strong communicative impact: “Do not give up, go beyond, overcome barriers when we are confronted with difficult situations, such as the barriers that separate us from others”. Design stimulates us to overcome the boundaries to reach the essence of innovation and experimentation. Speaking of experimentation, the eco-sustainable aspects of design cannot be overlooked, nowadays more and more aimed at limiting waste and the use of alternative and green materials. This is the case of the RIMU, PUKEN and WALUNG projects by Alessio Tanzini – Alma Eterea Zero Waste Design. RIMU is a horizontal organic compost bin that helps people reduce their organic waste, turning it into useful manure for garden plants. PUKEN is a container for cold storage of fruit and vegetables without the use of electricity. WALUNG is a container for loose food, with the characteristic of having a glass body and a terracotta base on which there is a cut that allows controlled release of food. Directly from Denmark, UnKnown Furniture, the brand created by Latvian designer Raimonds Cirulis, lands in Lambrate and presents [BLACK] series, the first furniture line entirely in volcanic lava / basalt ever created in the world. The flexibility and unique qualities of the material have no limits for creating innovative designs. Lava is also known as volcanic basalt – also known as “green industrial material of the 21st century”. Basalt stones are found in the earth’s crust: they are heated to 1450 degrees Celsius and the liquid mass is pressed through nozzles to produce long fibers. With these fibers, each piece of furniture is shaped by hand. The Brooklyn based designers collective NOTHING, founded by Caroline Kable, Peter Lokken and Hayoung Lee experiments and uses new materials. Together they create unique, functional and decorative sculptural objects, using natural components. An example is Fabrazzo, a series of recycled paper tiles made with fabric waste. Great space is left to the Academies and Schools around the world that, with their experimental projects, show the visitors a fresh and avant-garde side of design. One example is the installation carried out by the students of the Masterstudio Design of the FHNW Academy or Art and Design in Basel, which consists of a transparent pneumatic structure filled with Swiss mountain air, ready to offer visitors the opportunity to take a breath of fresh air. fresh air during the hectic week of the Fuorisalone. Flow Pressure elicit a critical and playful reflection through the bubble symbol, translating it into abstract iterations, such as the environmental bubble and the economic bubble, in a physical and interactive experience that specifically deals with the effects of air pollution. The University of G. d’Annunzio of Chieti-Pescara presents part of the teaching activities developed in the Department of Architecture, within the Design Course. Specifically, students exhibit communicative artifacts designed during the courses. The best results obtained during the first two years of the Product Design course in the kitchen and bathroom furniture and wellness system design are shown. For the Communication area, students propose the best works on the design themes related to the Design of the User Manual of coordinated image for the museums of the Province of Pescara. 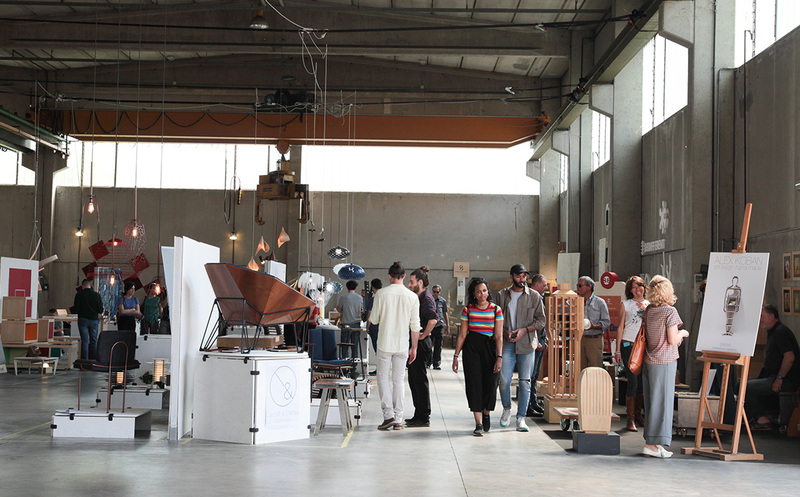 The students of the NID, New Design Institute of Perugia, renew their presence at the Din, for the third consecutive year, showing a series of ceramic objects derived from a study on the semiotics of exclusively decorative objects, according to a trend that sees domestic spaces increasingly populated by iconographic accessories. The artistic component is fundamental this year, which blending with the elegant lines of furniture and furnishing complements, gives life to products halfway between art and design. Directly from Abu Dhabi, it presents its selection of Encrypted Art Gallery products, a fusion of an ancient gallery and a design studio. The result is a conceptual space aimed at showing unique objects that are both functional and aesthetically appreciable. Among all, it stands out Illusion, a table lamp composed of an acrylic block that houses a Light Capsule and a small sink on top. This furnishing accessory with an oriental flavour is the ideal object to place tool of everyday life, masking its functionality with its strong artistic component. Close to art, of the illustration in this case, are the products of the Pictoom, which derives from the fusion of the words Picture and Room, art in a room. It is therefore not only art and not just furniture: it is the image that dresses the furniture and it is the piece of furniture that gives shape to the image. It is an art that has the strength to come out of paper to create a direct link with people: Pictoom wants to create a piece of furniture made of art that is understandable, human and exciting. This fusion between the two worlds was possible thanks to the collaboration of the Marogna company and some of the most famous Italian illustrators at international level. Within the industrial space, the Temporary Shop of about 300 square meters signed by Artistarjewels.com, dedicated to the sale of unique and creative contemporary jewellery creations, is also confirmed.